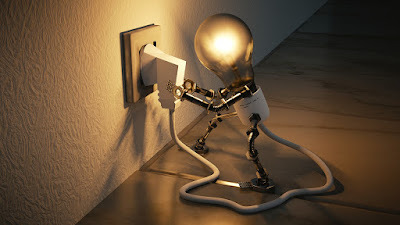 Hello Readers, As this blog is focused only on helping people with their Electricity Needs. We brought another great post on offers related with Online DHBVN Bill Payment. The offers list will be updated time to time to give you the best offers available. The online portal recently got added in Paytm which made it easy for the users to Pay DHBVN Bill online easily. Paytm also gives cashback offers to the users for using the services. So you can save money on your Electricity bill payments. On the left hand side there is an option to choose state. Step 3: Choose Haryana as the State as we are going to get offers on DHBVN Bill Payment. Step 4: Then it will show an option to choose Electricity Board, Select Dakshin Harayana Bijli Vitran Nigam and then click on Proceed. Step 5: Two more options will appear as Account Number and Mobile Number. Fill in your DHBVN account number and the contact number that is associated with that account and click on Proceed. Step 6: It will show you each and every details about your latest bill. The Name, DHBVN Bill Number, Amount to be paid. Step 7: Check all the details carefully and proceed to pay the amount. Step 8: Now you will be asked to place a Promocode if you have any to get Cashback or Offers. Enter FIRSTPAY to get 50 Rupess off on your first Electricity Bill Payment Through Paytm. Step 9: Apply the promo and pay the money with any of the shown payment method. You will get your cashback within 24 hours. Same process can be used in the Paytm mobile application for paying electricity bills. The promocode is FIRSTPAY and can be used only once per user. Everyone wants to save money and Electricity is one of the major expenditure every month. As it is the everyday need so it can't be brought down to zero but there are many ways to save money on your Electricity bills. The first step in reducing the use of energy is to know the exact usage of the same. You should know which all things are taking up the major part of your Electricity usage. In most of the houses cooling or heating takes up the major fraction of the total electricity usage. Note down the things that are on the top of the list and then we will be looking at the ways to efficiently manage them. Using them at an appropriate temperature. Shutting them down when not in use, You can set timer for the same. Keeping the room/space closed when they are in use. You can also run them in Power Saving Mode if they have. Following the above steps will help you in reducing the overall energy consumption. Same as summers, Winters too have an automatic increase in the energy consumption due to the use of Room heaters. Applying the same things with room heaters can help you in saving lots of energy which indirectly saves money. We have been taught this thing right from the Kindergarten that you should always switch off the electrical appliances when not in use. This thing really impacts the energy usage and reduces the bills upto 10%. Switch off the fans, lights of the room which is vacant so that it doesn't wastes energy. Not just for saving money but saving energy is also important. Use things mostly in energy saving mode like your refrigerator or Coolers etc. Even the Government is encouraging to move to the use of LED lights. These lights work on very low power range and thus saves energy at very high rate. Suppose earlier you were using an 100 watt bulb or 60 watt Tubelight, You can use 6 to 10 LEDs in place of just one light of that kind. This means you can use LED lights in all your house and it will consume energy of only one previous light. Washing clothes is also a necessary day to day task which can't be neglected. There is a lot of energy requirement in Washing and Drying Clothes. Its important to take care of the Washing schedule and Wash the clothes in Group rather than Washing them Individually. Use Hot water for washing clothes as it will clean out them faster and better than cold water. Choosing the clothes to dry naturally in place of drying them in the Dryer saves a lot of energy in the mean time. If you are using Inductions to cook your food than you are consuming too much of energy. You can either switch to LPG cylinders or can divide the usage alternatively. Cleaning also takes up much of your energy requirement calculations. The dishwasher you are using to clean the utensils or the vacuum cleaner that you use to clean the house would be taking very much energy. Try to reduce the use of automatic means and start balancing it with the manual means. This can surely decrease the dependency as well as the electrical need. Solar Energy is the most efficient energy to be used in houses. You can start with installing small solar panels at your rooftop which can be used to turn up light or a fan. Solar geysers and heaters could also be used in place of electrical appliances. These were some tips and ways to save money on your electricity bills. This will not change in a single day but you will see the dramatic change in the decrease of electricity usage. 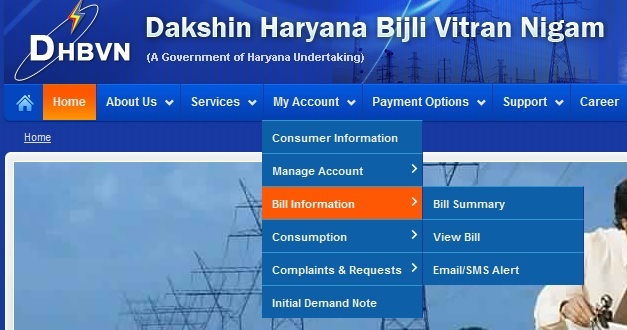 Hello Readers, In this articles we will be looking at the process to View DHBVN bill details online. The DHBVN portal allow its users to view and download bills directly. This helps the consumer as anyone can view their DHBVN bills online without the need to go to the office. After reading the above articles you can now continue to the current article. Just follow the simple procedure given below. Step 1: Firstly Login into your DHBVN Account. Step 2: You will be currently on your Home Screen of the Portal. Step 3: Move your Cursor or Click on the My Account section. Step 4: You will see a drop down list with more options. Now Take the Cursor on Bill Information Section. DHBVN Bill Summary: Click on this if you want to know about the last 5 to 6 Bills that you have paid or received. DHBVN View Bill: Click on this if you want to Download DHBVN Bills that you have received earlier. Email/SMS Alert: You can click on this if you want Email or SMS alerts for your upcoming bills directly on your Email or Mobile Number. You can either see the summary of your previous bills or can even download them for future reference or if you lost your original DHBVN bill. This was just a small step by step guide to let you Check your DHBVN bills and download if you want. 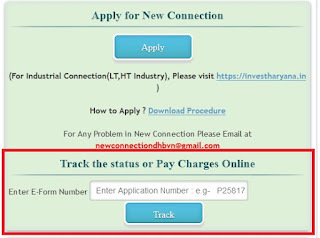 This article will help you to track DHBVN Application Status Online. 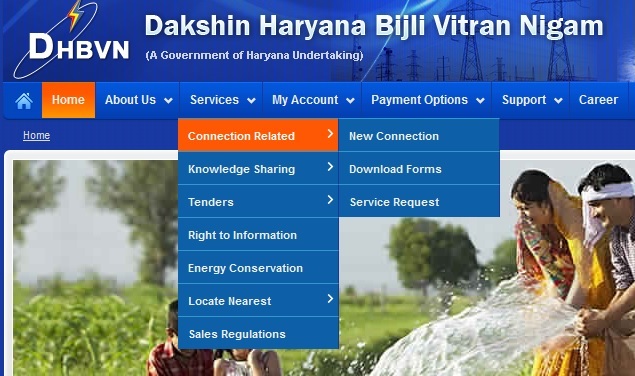 If You have filled an application for DHBVN New Connection Online or an application for the Extension of Electricity Load you might want to track it. To track an application means to know at which stage your online application has been reached. It takes many days to accept and process the online application filled by consumers. DHBVN web portal generates a unique Application number for each submission. This number could be used to track your current stage of that application file. You should have that number in order to get the tracking details or else you will not be able to do that. Step 2: Now move to the Services section, Then Connection Related and then New Connection. Step 3: Click on the New Connection option and you will be taken to another page. Step 5: Just enter the Application Number that you got after submitting the application. Step 6: You will get complete information about the status of your filled application. If you have not yet paid the fees, pay it to send the application for processing. These were the steps for tracking an DHBVN online application status. It can take upto two weeks for the processing and final steps. Check your status on daily basis to keep a track on your application status. Hello readers, Today's post is about applying for DHBVN Load Extension Online through the online portal provided by the company itself. The Extension of load means the Load you have at your home or industry is not sufficient as per your needs and requirements. DHBVN has made it very easy to fill and application for DHBVN Load Extension Online in simple and easy steps. The Process is similar as we followed in the application for DHBVN New Connection. And in this article we will guide you through it step by step. This guide is basically for an Individual who is willing to apply for Load Extension in DHBVN. It is not focused for Industries or any other business house as there are separate documents required for them. But the application process is still same. So they can also see the process to know how to apply online in DHBVN Web portal. Step 1: Go the DHBVN Web Portal by Clicking Here. Step 2: Now move to the Services option from navigation menu and then to Connection Related. Don't get confuse as all the applications are filled through the New Connection page. Just follow the below steps to know further process of Extension of Electricity Load in DHBVN. Information Section: This section has all the information about application process such as document required, choosing the category of New Supply, Charges required and many more. Just Select the desired thing and the PDF file will open with related details. Employee Log In: Its for the employees only working in DHBVN and the consumer don't have to do anything with it. 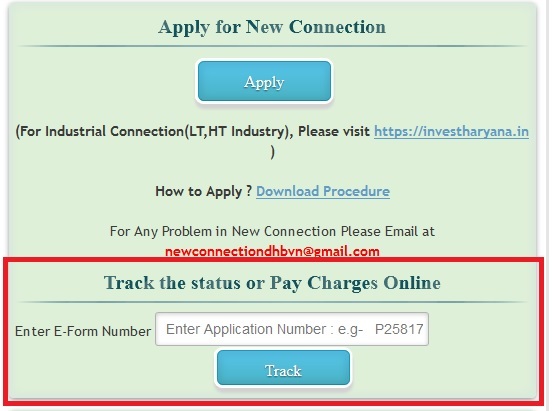 Apply for New Connection: This section takes you to the Online Application form which you have to fill for the New DHBVN Connection. You can use this section also to track the application you have submitted earlier(If Any). Calculate Your Charges: This section allows you to calculate the charges you have to pay after the application is filled. Choose the category and load, you will get the charges accordingly. For Extension of Electricity Load we will only deal with the Apply Online Section. Step 5: Click on the Apply button and the system will present you an Application form which you need to fill for the submission. Circle: See the circle from your Electricity Bill or you can contact the customer care for asking the same. Subdivision: This is also available on your electricity bill at the top left corner. Category: Choose your specific category, for household supply Domestic category is needed generally. Application For: Choose Load Extension from the list. Type of Supply: Either Temporary or Permanent whichever you need. Application Type: Choose Individual if you are applying as an Individual person for household. Other Details in that Section: Fill the Address and other common details. Identity Proof: Write the words Aadhar Card or whatever document you are uploading for Identity proof. Connected Load: There you will get two fields, Enter the already connected load in one field and the new Load that you require in another field. Purpose of Supply: Write the category you have chosen for your supply. Supply Metering Equipment: Choose either you already have the meter equipments or you require them from the company. User Photograph : The scanned photograph of the user applying for a new electricity connection. The size of the file should be less than 50 Kb. Proof of Ownership: The scanned document representing you as the owner of that house you are applying for. Check the required documents form from the website for knowing which all documents are accepted as the ownership proof. Identity Proof: Identity proof of the account holder. Check the required document form and know what all identity proofs are accepted. Step 7:Fill the account number and address for which you require to extend the load. Step 8: Click on the I Agree box and then you should click on Apply button. Step 9: An application number will be generated and a form which you can download for future reference. Step 10: The final step is to check all the details carefully and to pay the fees for the online application. It will take few days before your submitted application for DHBVN Extension of Load Online will be processed and worked upon. The tracking that is provided t you can be used to track the current stage of your application. I hope this guide will help you in filling your application for Extension of Electricity Load in DHBVN successfully.